Kevin Powell’s blue eyes light up when he talks about his passion for Carolina sports. From local to national teams, Powell is a true sports enthusiast sharing statistics and player data like an experienced announcer. His wheelchair is proudly decorated in the distinctive Carolina Panthers colors of black and royal blue. A long-time attendee of Columbus Industries located in Whiteville, Powell, 41, has participated in the day program for over 15 years. 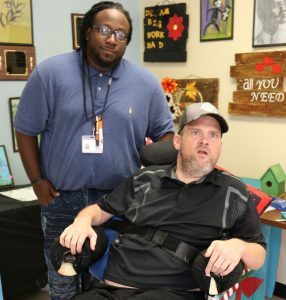 Recently, Powell enjoyed being actively involved in the interview process for his new direct support professional (DSP). Powell knew what he was looking for in a one-on-one, support person. A number of candidates were interviewed for the role. However, not surprisingly, sports turned out to be the common bond. Community Engagement Team Leader Susie Nathan saw something that “just clicked” when Powell met with Charles Colvin for the initial interview to be considered for the vocational developmental specialist role. “Kevin was excited Charles had the same interests and both were Carolina Panther fans,” she says. Until Colvin was selected as Powell’s regular DSP, staff such as Vickie Powell-Cross, a development specialist vocational-instructor, filled in. Powell struggled with the adjustments in staffing, which sometimes affected his mood. But since being paired with Colvin and taking an active interest in a variety of art techniques at 1019 The Making Place, located down the road from Columbus Industries, staff has seen a positive transformation in Powell. Sadly, there was a time, Sheila admits, that physicians didn’t paint a bright future for her son and limited his time due to his cerebral palsy and muscle atrophy diagnoses. “He has proven them wrong. He has outlived what they predicted,” she shares with a smile. Photo caption: DSP Charles Colvin, left, and Kevin Powell, right, take a break from activities at Columbus Industries.